In 1971 an outdoor centre at Ardentinny in Cowal opened for 3rd year pupils in Renfrewshire as well as an annual week art course for senior pupils. It was there that Don McNeil DA and Jim Davis DA met and became close friends resulting in them travelling throughout Scotland but especially to Arisaig on working holidays. Laterally, Argyll and Bute pupils were invited to take part in the art week and that brought a John Archbold, Principal teacher on Mull together with Don and Jim. 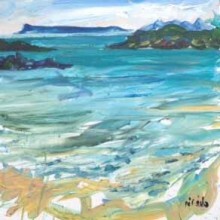 In the early 90’s the three spent a week up at Arisaig and decided to hold an open air exhibition on the shores of Traigh Beach overlooking Eigg and Rum. Jim put a sign above the blue van – ‘Freshly caught paintings for sale’ and Don added underneath ‘By the Scottish Ruralists’ and that was the birth of that group. On their next trip John could not manage so Jim decided to invite two of his art school contemporaries, Euan Douglas (Dougie) and Glen Neil, both from Aberdeen and both principal teachers as well. There then followed weeks away painting and a series of exhibitions throughout Scotland from Stonehaven, Edinburgh and Aberfoyle under the title ‘The Scottish Ruralists’. What became evident, when their work was displayed together, is that they have not attempted to forge a common style of any kind although equally evident is the remarkable coherent current of feeling that runs through all this diversity. It is quite simply an association of friends who share strongly held views on the nature of art, and who felt the need at a certain point to make a commitments to those values they held important. 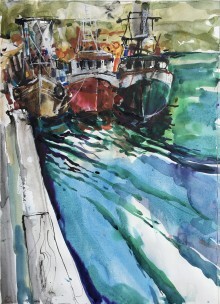 In 1995 Don took early retirement and started a new life with Jean, now his wife, who is also a painter, so he lost contact with the other four who continually went on their week’s jaunt year in year out especially to Mallaig and they eventually started exhibiting at the Mallaig Art Gallery – Jim, John, Glen and Dougie. 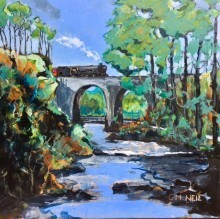 In 2017 Dougie died and this brought the whole group together at his funeral and Don was encouraged by his wife to join John, Jim and Glen when they go off for their week’s painting. A major exhibition called ‘The Revival of the Scottish Ruralists’ is being planned for November 2019 at the Dunoon Burgh Hall. 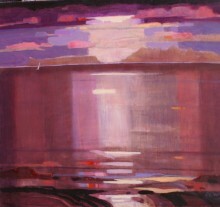 This will include work by the late Dougie as well as work from a couple of new artists who have joined. However Mallaig Art Gallery by sheer coincidence is showing work from four of the five original Ruralists and is the first gallery in Scotland since 1993 to exhibit their work together as a group.